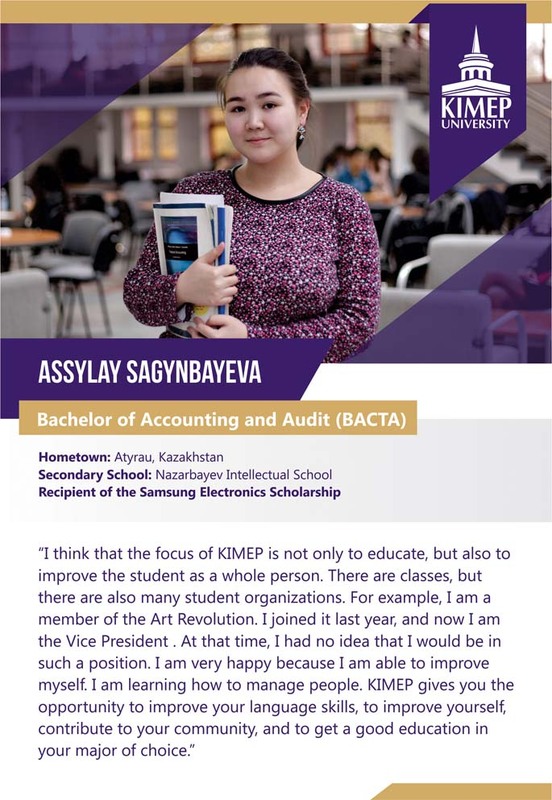 I chose KIMEP because at that time it was one of the most prestigious universities in Kazakhstan and it offered the best education in the fields I was interested in. Those years were the most fun I had in my life. New friends, new experiences, becoming an adult. All that is priceless. Every one of my professors had a huge impact and shared the most valuable knowledge with me. Currently, I’m working on many different projects including Mercedes-Benz Fashion Week Almaty; I co-own a model agency called EAT Models and expand projects in restaurants and bar industry with my business partners. Since I’m co-owning all of the businesses I’m a part of, the main thing that KIMEP helped me with is to learn how to manage all the business processes including the main one – the finances. When you study, you actually take all of the classes as something that you do for parents or for teachers and you are trying your best to ace that, but still you do it automatically. You understand the value of that knowledge only when you face it on your own in real life. I’m very close with some of my classmates and we hang out every week. It’s always good to have around the people who you know for that long. Especially the ones you met in university. I would recommend current students to pick your education and your path very consciously and believe that everything is possible. Do it for yourself and yourself only. As for my hobbies, I travel. That’s my main remedy from stresses. My ideas on happiness and success: as long as you are free within yourself, do what you like, surround yourself with the people that uplift and nourish you and you will be in love, you will be happy and successful. Anything else you would like to share with the KIMEP community? – No one knows what they are doing so don’t be afraid. As I reflect on eight years of my professional career, I see a clear pattern – whenever I felt finally settled and successful, I pushed myself out of my comfort zone and started all over again. Along the way, I would learn new things, discover new areas for personal development, and create new ideas. It wasn’t all romantic though – I had moments of fear, pain and confidence issues. However, the principle of “being a beginner again” allowed me to constantly grow, and this is what I enjoy the most! I would like to share some highlights of my journey with magazine readers in case they will find it useful and get inspired to start fresh. “KPMG is hiring!” – I read with excitement in the ad posted by the Career and Development Center. It was the year 2009 when financial markets were still recovering from the global financial crisis. KPMG hired only 13 graduates that year compared to the 70 in the previous year, and I was one of the lucky 13! 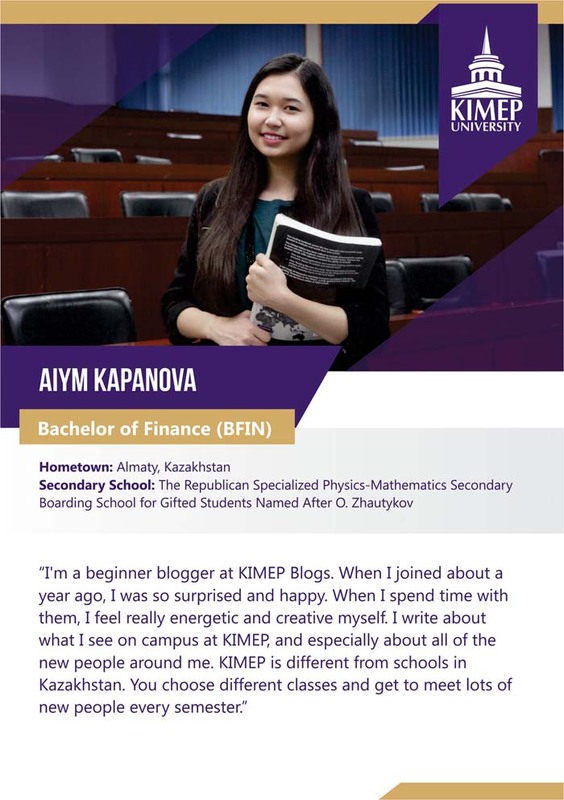 I feel so grateful to KIMEP for providing me with strong knowledge of accounting and finance which, coupled with my internships, part-time jobs, and extracurricular activities, secured me a place at KPMG. There I was, fresh from university, starting my first ever serious career with an international firm. My personal and professional growth there was spectacular on all fronts. The most important skills I mastered at KPMG, which I believe will serve me for the rest of my life, are quick learning and adaptation to the new environment. On average, every month I was starting a new audit project, which meant a new company and a new industry to research, new organizational structure and operations to study, new problems to solve, and new people to build relationships with. The most memorable and developing experience I had at KPMG is when I was entrusted to lead an audit of our new banking client. Imagine a 20-year-old with limited knowledge of banking industry and a team of 3 older colleagues to manage. I was both feared to death and excited to try myself in the new role. I believed I could do it and took one small step at a time, including asking many questions from my supportive senior colleagues. Fast forward, a couple of years, at the age of 24, I became the youngest Audit Manager in the local practice history with boosted self-confidence and strong belief that nothing is impossible. So, I started looking for new challenges again. I had always wanted to get an international experience in studying and working abroad. Muskie Graduate Fellowship Program was the only merit-based fellowship sponsoring MBA degree at that time. Having been through a highly competitive selection process, I got in top 2% out of over 3,000 applicants. Feeling like a super star, I arrived at the Muskie induction course in Washington DC. There I met other 65 finalists with different backgrounds from various countries. They were the brightest people I had met, with great achievements and aspirations. I soon realized how foolish it was to think that I had achieved a lot, and discovered new horizons for my further development. It was a wakeup call for me to raise the bar and set higher standards for myself. Since then, I consciously seek to surround myself with people I look up to, in order to stay humble and constantly fuel the urge for growth. When I was doing my MBA, I grew a dream that seemed unreal at first – to join the International Finance Corporation (IFC), a private arm of the World Bank Group (WBG). I heard lots of myths how hard it was to get there. The most “scary” for me was that they recruit only MBAs from top B-Schools and experts with a brilliant track record of at least 20 years of experience and that I must live in DC for constant networking. And I did not have any of that! Moreover, I had no idea where to start. But my goal was clear – I aimed to get a temporary assignment at the IFC HQ for the Fall. As networking is a primary tool for getting a job in the US, I learned how to do it. I emailed over 30 people around the globe reaching out to current and ex-WBG employees and asked them to share their WBG recruitment and work experience with me over a 15-minute call or Skype session. All the effort with crafting every message, hosting calls and building relationships abundantly paid off. I was offered a job as I specifically wanted it. The lesson I learned here was to always aim at high, and never settle for less than your dream level. Find what you truly want and go for it by taking necessary steps, keep practicing and refining your approach until you get what you want. IFC experience opened new doors for me – I discovered a whole new world of global investments. Driven by my curiosity to learn more about the industry, I started looking for new opportunities. This time my search was different – I became more conscious of my career values, i.e. the things that were important for me at work. My first career value is Impact. I want to see how my decisions and actions lead to the positive changes in our society. The organization I joined, National Investment Corporation of NBK (NIC), manages funds, which belong to the people of Kazakhstan. And in my role, as a global real estate investor, I contribute to constructing an asset management program with the aim to enhance wealth for our future generations. My second career value is learning and development. My new challenge was to launch a diversified investment program in global real estate from scratch. This had never been done on an institutional scale in Kazakhstan before. I still vividly remember my first day at NIC when I had a meeting with top managers from BlackRock – the first 20 minutes I did not understand what they were talking about! It was all new – terminology, thinking, and communication. I am glad that I overcame the doubt of leaving my Big4 Manager position and started a new career from the very beginning. It has been a rewarding experience for me so far which stretched me in so many ways: learning a new profession, acquiring a global mindset, and adjusting to a quasi-government organization dynamic. Having enjoyed my career journey so far, I realized that sweetness from achieving and overcoming yet another challenge does not last long. What kept me fulfilled until now is the joy of helping and seeing others succeeding – my junior team members who I mentored, job seekers who I coached, and the friends who I shared my advice with. That’s why this August I decided to embark on yet another venture – I co-founded career coaching company “ArchiteCT” to help students and young professionals find what they love doing and successfully get through recruitment processes both in Kazakhstan and abroad. I believe that the more successful professionals we grow, the more prosperous our country will become! Hello, Diyar. 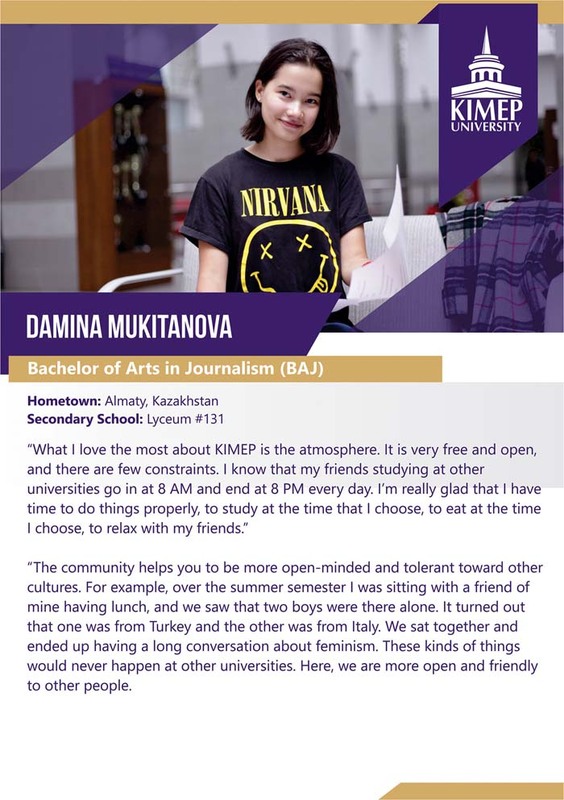 Could you please tell us a couple of words about your life at KIMEP University and what happened after? Hi, Raushan. First, let me express my deepest gratitude to KIMEP and its faculty, who helped me find my own path in my professional life. I got my Bachelor’s degree in 2009 with a Major in Marketing and a Minor in Operational Management. Both helped me a lot. I managed to finish the program in 3 years and was brimming with motivation and knowledge, which helped me find the best place to join. After graduation in 2009, I joined Toyota Company and at first, I was responsible for Logistics. At Toyota, this meant storage, transportation, and insurance of vehicles. All the knowledge I had from my OM courses (which seemed useless sometimes during classes) helped me prove my true competence in the eyes of my management. Then, I moved to the Marketing department, where I was responsible for the Lexus brand. Later, after a couple of years, Samsung invited me to join their Sales department and I was happy to check my sales and marketing skills in the highly competitive electronics market. Years after, I was promoted to the role of Head of the Marketing Department and was responsible for Marketing in 9 countries in Central Asia. Now, I am leading a project in e-commerce called TALAPAI. Why did you decide to leave corporate life and started your own business? When I was working for one of the most ambitious companies in the world – Samsung, I realized that in the middle of the 21th century a single person in South Korea launched a small company, which then turned into the biggest electronics supplier in the world. And I thought, why not me?! I know, it sounds somewhat funny and naïve, but I did not care. What I knew at that time was that this idea was fixed in my head. Thus, in 2014, my business partner and I decided to launch TALAPAI. Now TALAPAI is a company that employs more than 20 people and has huge intellectual potential. Last year we had a turnover of approximately 500 mln. tenge and we are still growing. This summer we are celebrating our two-year anniversary. Talapai is an online shop where you can buy electronics and soon we are expanding our assortment to three times the current amount. What do you think about the competitiveness of KIMEP graduates in the Kazakhstani market? You know, all the best employers are hunting after KIMEP graduates starting from the moment they graduate. For example, let us look at the Big 4. I think 80% of people in that market are KIMEP graduates. We have great theoretical and practical knowledge that is applicable in the Kazakhstani market. You know, the main barrier in becoming successful is not solely knowledge, it is the fear of the unknown and the perfectionism that all knowledgeable people usually have in their heads. I believe that a KIMEP education builds this confidence, as well as professional knowledge. What would you recommend to the current students of your alma mater? I will make it short: Don’t be afraid of challenges. There are many of them coming your way. Always. Move forward and accept these challenges and make sure you overcome them all! How would you asses the quality of KIMEP graduates and their work in your company? Our company – KPMG – in Kazakhstan and Central Asia for more than 10 years already very closely cooperates with KIMEP University in selecting the young talented professionals to work at the company. KIMEP graduates comprise 1/3 of total number of our staffing, they are advanced strongployees of the company, dstrongonstrating the most efficient results of work. At the moment 50% of top managers of the company are graduates of KIMEP University. What is the difference between KIMEP graduates and graduates of other Kazakhstani universities? KIMEP graduates are different from graduates of other universities by the fact that they are prepared to the competitive business environment: they are fluent in English, they have excellent acadstrongic and practical knowledge of finance and accounting. They possess rstrongarkable presentation and communication skills, team-working skills, they quickly adapt to various situations and are able to think beyond certain patterns. They are brave in taking on the responsibility and often come up as team leaders, they are able to creatively approach the problstrong solving and to make a team together reach a productive result. How does usually the career of our graduates in your company start? Most often KIMEP graduates start their career in our company at the position of an intern, assistant auditor or consultant and equally with the whole team they fully take part in projects that our comoany implstrongents. Are today’s graduates different from graduates of the previous years(5, 10 years ago)? The situation at the labor market and in business as a whole has really changed within the recent 5-10 years, and accordingly the graduates of nowadays and the ones of 5-10 years ago are different. The main difference is readiness of graduates to start working. Now graduates are more conscious in selecting their specialization and future career. While studying their senior years in the university they concurrently work as interns in various spheres of business and after graduation from the university they more consciously select the specific department in building their career within the upcoming five years. Graduates now prefer work with opportunities of development of their professional skills, they stress an accent to «work & life balance”, i.е. to have a possibility of balance between their work and personal life, they do not just follow options of salary and social benefits when they select jobs. How do usually KIMEP graduates grow career-wise? 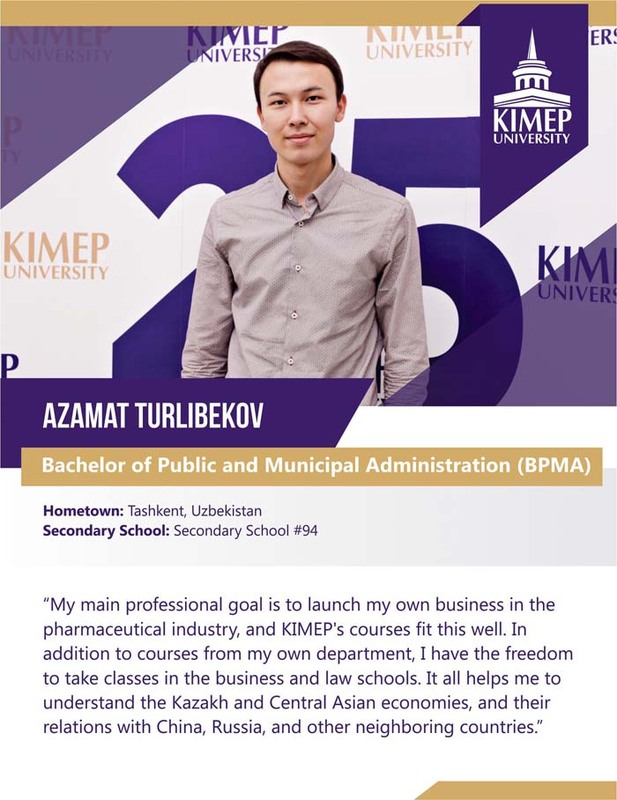 In KPMG graduates of KIMEP quickly grow career-wise. They start their work from the position of intern or assistant and gradually, each year, upon results of their work they get promoted to positions of: consultant, supervisor/senior consultant, manager, senior manager, director and partner. KIMEP graduates are leaders in “double promotions” in our company, which means that KIMEP graduates namely, more often than others get double career promotions, as compared to other strongployees being graduates of other universities. Your wishes to current applicants and students? Our company – KPMG – is always “hungry” for young and talented professionals, we always count on selecting the graduates, rather than experienced professionals. High results of acadstrongic performance represent an important factor when selecting the candidates, therefore we wish to current applicants and students to study hard and to take part as much as possible in the social life of the University. KIMEP University shows that here namely very talented, all-sided, active and ambitious youngsters of Kazakhstan are formed, and that there is an opportunity to develop oneself both acadstrongically and socially. We can give an assessment of 9 on a scale from 1 to 10. First of all, KIMEP graduates dstrongonstrate a good English proficiency, which they can use in the company/bank, which is now very important for strongployers; second, they have some, although not a major one, experience of working with projects, with various tasks that are very similar to real business situations; third – they possess good interpersonal qualities such as honesty, integrity and diligence. Starting from a young professional to a mid-level manager. Are today’s graduates different from graduates of the previous years (5, 10 years ago)? It is hard to say, since the time and the requirstrongents of strongployers always change. What peculiarities of the modern labor market do you note? For strongployer the professional qualities are not that important since it is something one can learn; what is important for an strongployer is personality qualities, enthusiasm and a high level of motivation of graduates. Starting from a young professional to a mid/top level manager. As the great Steve Jobs said: “Stay hungry, stay venturesome and then you will get it all!” it really works! About 80% of our company’s staff are KIMEP graduates. This shows that they are highly dstronganded. We would like to note that their work fully satisfies requirstrongents of modern business world. KIMEP is one of the main sources of highly qualified cadre in Kazakhstan. Graduates of this University are different with their high level of efficiency, analytical mindset, ability to think in a structured way, and, of course with their high English proficiency, which is very important for our company. Usually KIMEP graduates start their career from the position of intern or consultant. KIMEP graduates had very strong technical skills 10 years ago and they are still the same at present time. KIMEP graduates usually grow career-wise quite fast. For example, 6 partners of PwC are KIMEP graduates. To become high level professional and to strive to work at the best companies locally and abroad.